I will never understand why this man and many like him, get so worked up about strangers desires. Who I choose to spend my life with is of NO CONCERN OF YOURS. What we do in the bedroom is NONE OF YOUR BUSINESS. He uses some pretty graphic language in this rant. "Jump your bones" ? "Rammed down the throats"? This man and several other orgs. are band together to stop the repeal of DADT based on their own imagined fears. Keep in mind it is our brave LGBT troops that are the greater risk. 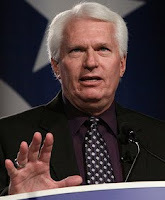 They will not be jumping out of the closet because of people like Bryan Fischer. Life in the service will stay just like it is now. Every one of our troops are doing the job they were trained to do. They will be a shining example for the world. "If you’re a service member with privacy concerns, forget about it. You will be forced to share open-bay showers with leering homosexuals and living quarters with fellow soldiers who may want to jump your bones. The repeal of the ban on homosexual service was rammed down the throats of the American public in a shameful and undemocratic lame duck session of Congress, by lawmakers who had been voted out of power by the American people. "The Democrats’ death rattle could be heard from coast to coast, but they reached out from the grave and grabbed the military by the neck in one final frenzied spasm. Well, there is a new posse in town, many of whom campaigned as friends of the family and supporters of sexual decency. As Chris Christie has said, perhaps now is the time for pro-family Republicans in the House to 'put up or shut up.' So who will step forward at this moment and demonstrate the leadership necessary to save America’s national defense from this disastrous exercise in social engineering?" - American Family Association radio host Bryan Fischer, joining the call to defund the repeal of DADT.